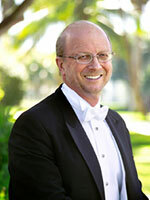 Jo-Michael Scheibe chairs the Thornton School of Music’s Department of Choral and Sacred Music at the University of Southern California, where he conducts the USC Chamber Singers, teaches choral conducting and choral methods, and supervises the graduate and undergraduate choral program. In 2008, he assumed a new post as National President Elect of the American Choral Directors’ Association. No stranger to the ACDA, Scheibe previously served as the organization’s Western Division President (1991-1993), as well as National Repertoire and Standards Chairperson for Community Colleges (1980-1989). Ensembles under his leadership have sung at six national ACDA conventions (1985, 1991, 1993, 1997, 2003, 2007), as well as two national conventions of the Music Educators National Conference (1996, 2000), and various regional and state conventions.